If you’re wondering what to make for dinner, check out these ideas. Even the most seasoned home cooks get stuck in a rut once in a while, and this post will help you come up with some simple new dinner foods that your family will love. I don’t know about you, but now that I’ve developed a steady list of dinners that our whole family likes, I’m less and less tempted to experiment with my weeknight dinner recipes. But after a while, even the most crowd-pleasing dinners can start to get a little stale. If you’re in the market for some new dinner ideas, there are a ton of obvious places to look: cookbooks, Pinterest, magazines, blogs, and food websites to name a few. 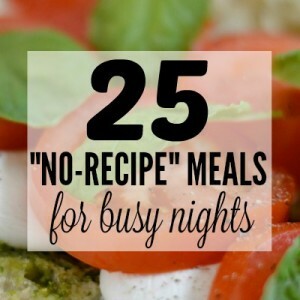 But I’ve found that having a zillion recipes at my disposal doesn’t always make it easy to find a really good one — especially when dealing with dietary restrictions, picky kids and particular tastes. 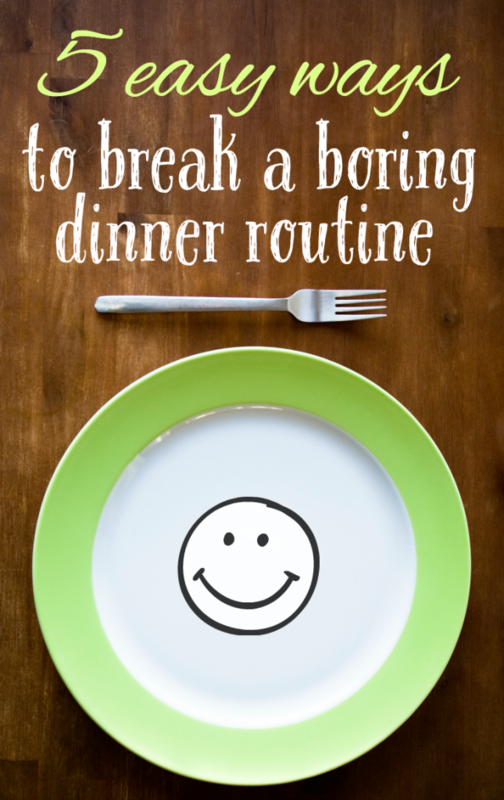 If you’re in need of some dinner inspiration, here are 5 simple things that you can do to break out of your dinner rut and make meal-time exciting again. Sometimes I fall into a habit of always serving potatoes with chicken or pasta with meatballs or cauliflower with ham. To mix things up, find three jars or containers and label them Protein, Starch, and Vegetable. Make a list of the foods in each category that your family likes, cut them out, and put them into the corresponding containers. 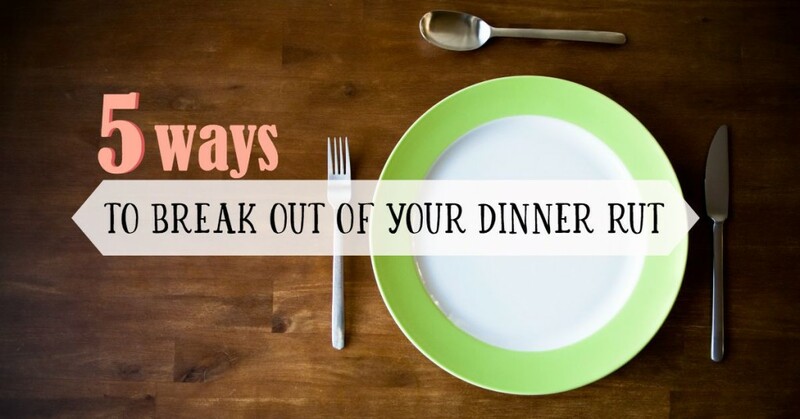 When you’re stuck in a dinner rut, have someone pull out a slip from each category. The foods themselves might be familiar, but the change-up in routine will keep you from getting bored. 2) Check out the pantry & grocery store aisles. I’m willing to bet your pantry is probably chock-full of recipes if you take the time to look. For years I never really paid attention to packaging recipes, until one time when I was desperately scrounging for ideas and came across a recipe for Tuscan Garbanzo Bean Soup on a can of Bush’s garbanzo beans. It ended up being delicious, and is now a regular in our soup rotation. Think about it — if a company is only choosing ONE recipe to showcase their product, they’re going to make sure it’s a really good one, right? In addition to checking out the items I already have, I’ll also turn over boxes right in the grocery store to see if inspiration strikes. If you find yourself wandering the aisles wondering what to make for dinner, try looking at packages of products you like to eat or cook with, such as broth, couscous/rice, sauces, pasta, canned salmon/tuna, beans, tomatoes, or frozen vegetables. 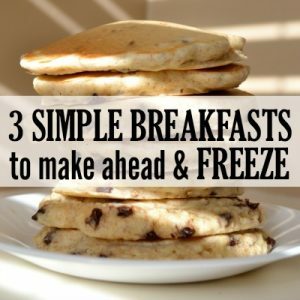 The recipes are usually pretty simple, straightforward and family dinner friendly. 3) Re-create favorite restaurant meals you love. Some of my favorite things to make — Italian chopped salad, fish tacos, and greek chicken wraps — came from replicating what we’ve enjoyed eating at restaurants. A lot of popular “restaurant foods,” like crab cakes and chicken parmesan, are actually really easy to make at home, not to mention a lot less expensive. 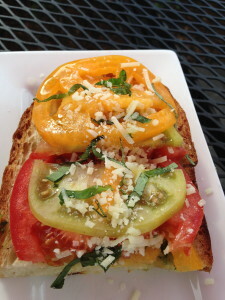 The newest one I just put on my “to make” list was grilled bread with pesto, tomatoes, basil & parmesan, which we had at The Tasting Room in Houston. When you’re stuck in a rut, just think about some of your favorite restaurant meals and then take a stab at making them yourself. 4) Ask friends what they’re having for dinner. I love finding out what other families regularly have for dinner, or any meal for that matter. Even if you don’t discover anything new, it could just be a simple way to jog your memory about a dish you haven’t made in a while. I frequently ask people what they’re cooking for dinner, or what their favorite “go to” dishes are. Through those posts, I always get great ideas, and sometimes people even share their recipes. You never know what you’ll discover just by asking a simple question! 5) Peruse the “pre-made meal” section of your grocery store. You know that glass-enclosed case where you can buy pre-cooked dinners to go? Even if you don’t buy anything there, it’s full of inspiration. Orzo salads, salmon burgers, lemon-pepper grilled chicken, roasted asparagus, balsamic green beans, turkey cutlets with gravy, sweet potato puree, quinoa salad, steak and broccoli stir-fry…those are just a few of the things I saw at the grocery store the other day. Even though I don’t typically buy those meals, I like to look at what’s offered because it can give me ideas for recipes to make at home. If anyone has any other tips to add, please share them in the comments! Great ideas! I actually thought there’d be an “Eat out on the porch” suggestion or something, lol. Go to Fresh Market once a week to pick up their great chicken to go with sides. Love your ideas. We have a Fresh Market right by us, and I’ve never tried their chicken…I’ll have to get some next time I go! 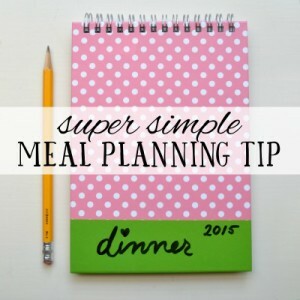 I love the idea of recreating favorite restaurant meals! Why didn’t I think of that?